Korra is back! Or should I say, the old badass Korra has returned. It took nine episodes and more spiritual journeys than it probably should have, but Korra finally seems to be over the mental block that was holding her back from being the avatar. With Kuvira gaining power and harvesting spirit vines to create her ultimate weapon, the world has never needed Korra to be at full strength more. The episode began with the repercussions of Kuvira’s environmental faux pas. The spirit wilds in Republic City weren’t happy with what was going on in the swamp, so they began kidnapping innocent tourists and trapping them in the spirit world. Quick thought: Whose first instinct when they see an angry spirit vine coming at them is, “I’m gonna poke it with a stick?” Stupid tourists. Jinora sensed a disturbance in the force, and Korra used her tree technique to see Kuvira’s army tearing up the swamp. She crashed a meeting between Reiko, Tenzin, Lin, Wu (who is still the worst) and Fire Lord Azumi to relay this information. Korra was offended she wasn’t invited to this little powwow, but her annoyance was interrupted by the reappearance of Varrick and Bolin, who let everyone know they had escaped Kuvira and had information that could be helpful in taking her down. Reiko and Lin agreed to not attack Kuvira outright and instead fortify the nation’s borders against her to appease Tenzin and Azumi. This didn’t sit well with Lin, who took Opal aside and told her it was time to take matters into their own hands. The two planned to infiltrate Zaofu and liberate their family, who Kuvira has been holding hostage for a few episodes now. While investigating the disappearance of the tourists, the vines take Jinora. She was able to relay a quick astral projection message to Korra, who rushed to her aid. She and Mako dodged a few vines before finding the pods that trapped the bodies of those the vines had taken. Korra tried to meditate into the spirit world to find them, but instead was met by a flashback of her fight with Zaheer. 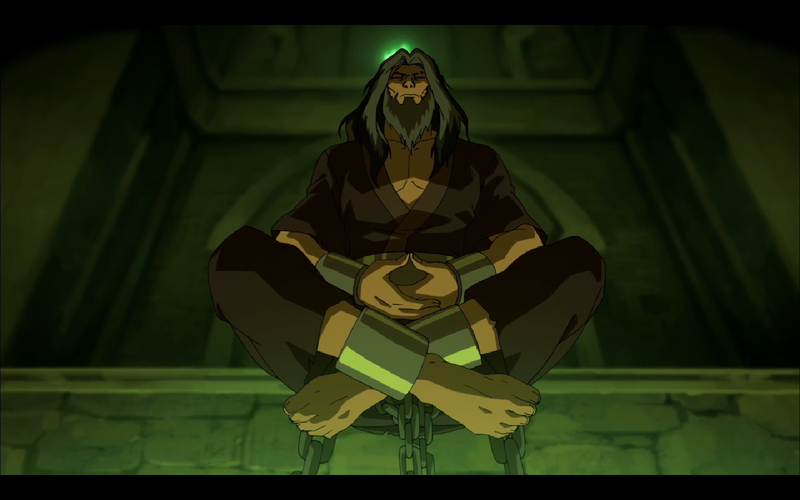 Korra decided the only way to get over that was to visit Zaheer in his prison outside of Republic City. 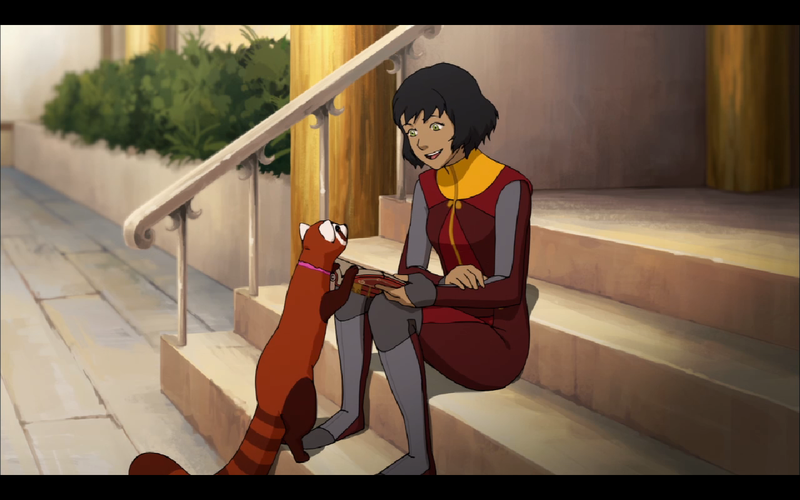 Cut to Bolin’s reunion with Pabu, which is beyond adorable because Pabu is 10 times cuter than Momo ever was in “The Last Airbender” (there I said it). Bolin tried to use Pabu to get Opal to talk to him, but she just yelled at him and reminded Bolin that he’s part of the reason her family was torn apart and her city was overrun by Kuvira’s forces. She made good points. There was a quick scene where Reiko brought Asami and Varrick together to work on a way to counter Kuvira’s spirit vine weapon. 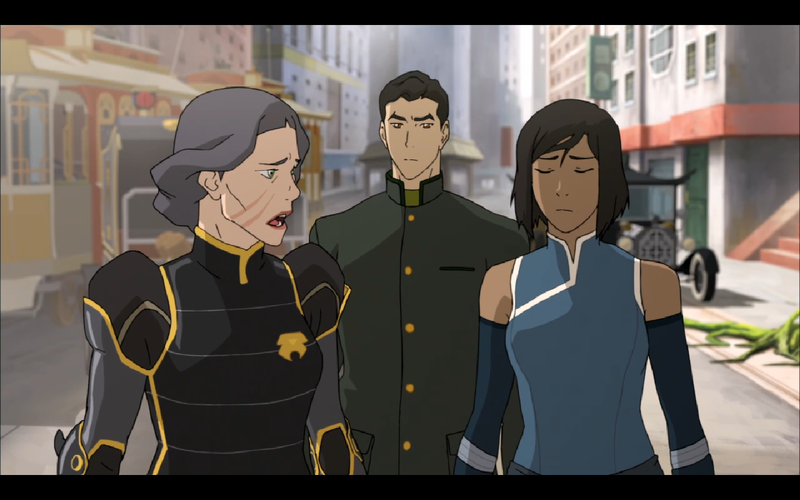 Of course Asami hates Varrick with a burning passion after he tried to take over her company. She was willing to work with him for the greater good, but this should be a fun dynamic going forward. Korra visited Zaheer, whose hair and beard look like they did at the beginning of Book 3 before he got airbending. For some reason, Zaheer was willing to help Korra get her spiritual mojo back. I think it was because he didn’t like the idea of Kuvira having so much power, but this was a pretty drastic turnaround for someone set on killing the avatar a few short years ago. Maybe some more solitude gave him time to think, but then again that didn’t work the first time he was incarcerated. Whatever, I’ll let this one go. The episode ended with Bolin declaring his love for Opal and her recruiting him on the secret mission to free her family from Zaofu. Kuvira hasn’t been in the last few episodes, so lord knows what she has been doing in Zaofu while everyone else has been putzing around in Republic City. Hopefully Bolin, Opal and Lin are more prepared to take her on than Su and Korra were.